Be Free For Me Blog » Blog Archive » Happy Spring… Happy Gluten-Free Carrot Cake! Happy Spring… Happy Gluten-Free Carrot Cake! When I think of springtime, certain foods come to mind. But the sweetest thought of all is that of sweet, moist and fresh Carrot Cake – right out of the oven, and prepared gluten-free style. I have the best gluten-free Carrot Cake recipe around. Over the years I’ve tweaked the recipe so it’s perfect – moist, full of carrots, and with just enough sweetness. It’s an all-time favorite for the gluten-free and the non-gluten-free alike, and it’s perfect for a brunch or dessert. Make sure you bring along the copy of the recipe to pass along to others! 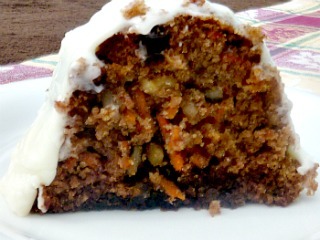 If you are a Carrot Cake fan you will love this recipe! Moist and rich, it is perfect for breakfast, brunch or for dessert. Buy pre-shredded carrots to make your job easier. Omit walnuts to make nut-free. Enjoy! Mix together the grated carrots and chopped walnuts. Set aside. Cream the oil, eggs and sugar. Add carrots and nuts. In another bowl sift together the flour, cinnamon, salt, nutmeg and soda. Slowly add to carrot mixture. Add the raisins. Grease and flour (make sure you use gluten-free flour!) a 10” tube pan or 9”x14” pan. Bake at 325 degrees for about an hour. Cool before frosting. Cream together butter, cream cheese & vanilla. Add sugar, beat until smooth. This entry was posted on Friday, April 6th, 2012 at 3:32 pm	and is filed under Recipes. You can follow any responses to this entry through the RSS 2.0 feed. You can leave a response, or trackback from your own site.